YouTube is undoubtedly one of the best sources of video content and we all love it. The video-sharing site hosts a ton of interesting videos across various categories that anyone can watch without spending a dime. However, there is one useful feature that YouTube hasn’t implemented in its web version yet. i.e. the ability to read comments while watching a video. Perhaps, if you frequently access YouTube on your computer then you might have definitely missed this certain feature at some point in time. On the other hand, YouTube apps for iOS and Android allow us to scroll through the comments while watching a video. In case of the web interface, the video placement is static which gets hidden as we scroll down the page to view comments. This has been a native functionality since long and sadly YouTube doesn’t offer a choice to enjoy both simultaneously, regardless of the screen size. If you usually watch interviews or video podcasts and prefer reading the interesting comments at the same time, then Mini Y extension for Google Chrome is your best bet. 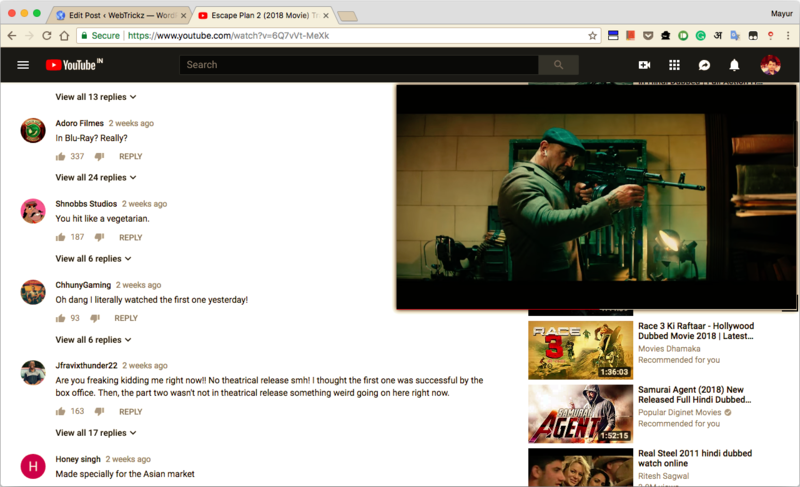 Mini Y for Chrome makes it possible to read and write comments on YouTube while letting you view a video seamlessly at the same time. The app does this by automatically switching the video player into a floating pop-up on the screen as you scroll down while scrolling up restores the video to its original position. The extension packs some small yet nifty features too. Users can drag and place the floating video to the desired position on the screen. The player size can further be easily changed to either small, medium, large or XL using the overlay icons. One can play/pause and forward or rewind the video with the given seek bar. Moreover, it preserves the screen size and position settings for the videos watched later by you. There is also a quick toggle to temporarily enable or disable the app. Don’t hold yourself and try Mini Y now! It is available on the Chrome web store. This doesn\’t work – the links are 404. What the hell does Google have against people wanting to be able to watch videos and scroll at the same time??? Damn.. seems it has been pulled off. Really bad. Working for me though as the extension is already added. Sad this feature has been pulled off. Was a good trick Mayur!